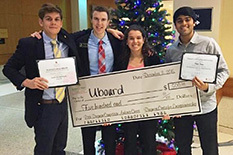 uBoard, a venture launched by a team that includes two EIPers, sophomore Erich Meissner and junior Tristan Prejean, won both the Audience Choice and Judge’s Choice awards at the 2016 Pitch Dingman Competition. The company makes comfortable, custom headboards that personalize college dorm rooms. The uBoard team started the company during their freshman year at the University of Maryland, building headboards for themselves and realizing the value they added to what they perceived as otherwise mundane dorm rooms. Beginning with only a few simple designs, the company is now expanding to provide a variety of options for any room.